The purpose of our Greenpoint Lead in Garden Soil Outreach Project is local environmental education and stewardship, and benefit the Greenpoint public by restoring Greenpoint soil. NAG is working to educate Greenpoint residents about reducing human exposure to lead by implementing safe gardening practices in areas with the potential for elevated levels of lead in soil. This project will help restore the soil in Greenpoint, thus improving public health. The project focuses on home and community gardens and young children most at risk to developmental issues as a result of high blood lead levels. To connect with the Greenpoint community, we hosted 5 lead in garden soil workshops- partnered with the Brooklyn College Analytical Center. These engaging and hands-on workshops provided information about soil remediation, education on the issue, and free soil testing! We had two workshops in the Fall of 2016 and three in the Spring of 2017. For our Spring workshops, we saw the demand for more information and soil testing opportunities, and invited Columbia University’s soil experts to join us. To give you an idea, overall, we took over 100 community based soil samples testing for lead, arsenic, copper and zinc. Focusing on the lead levels, we saw overall high levels from privetly owned spaces. On the positive side, we also saw the power of remediation! The EPA claims anything about 400ppm of lead is considered a “hazard.” One family brought in a yard soil sample which tested for lead at 2,105ppm (parts per million) – and another sample from that soil which had been mixed with healthy compost over time- the number went down to an extremely healthy 43ppm! We are also distributing educational brochures to the community- click here to download the pdf! Finally, we are working with Eco-Schools USA to produce a four day lesson plan. This curriculum will be distributed to various educators, parents and community leaders so people can easily teach kids how to safely interact with North Brooklyn soil. Although North Brooklyn is a beautiful community, it’s important that we remember where we came from. 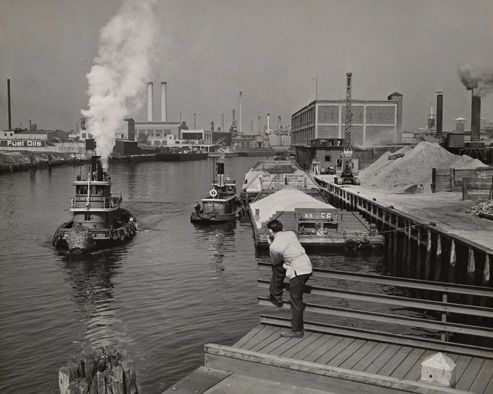 Greenpoint and Williamsburg, because of our perfect geographical location to the East River waterfront and Newtown Creek, was historically a highly industrial area. There were many factories and waste transfer stations which have contributed to the unfortunate environmental hazards of today. Our Lead in Garden Soil Outreach Project is focused on teaching our history and creating solutions.